Day three of CeBIT Australia and the energy around this fantastic business technology event is still in full force. This morning’s Startup Conference was all about the key role of startups and entrepreneurialism in driving jobs in NSW’s fast growing technology sector. An impressive line up of speakers including Sydney School of Entrepreneurship CEO Nick Kaye, Intelledox co-founder Michelle Melbourne, Slingshot CEO Karen Lawson, AirTree Ventures partner James Cameron, and Pollenizer CEO Phil Morle all gave some fresh insights into Australia’s burgeoning startup culture. Nick Kaye said the NSW Government’s $25 million investment in the Sydney School of Entrepreneurship was an unprecedented opportunity to foster a culture of entrepreneurialism and innovation in NSW across the state’s 11 universities and TAFE sector. “This is quite an incredible project and is something people will be watching closely,” he said. 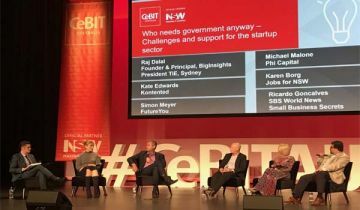 Jobs for NSW CEO Karen Borg also participated in an insightful panel discussion on startups and the role of government with Phi Capital CEO Michael Malone, Raj Dalal of TiE Sydney, Kate Edwards of Kontented, and Simon Meyer of FutureYou, facilitated by SBS business lead Ricardo Goncalves. 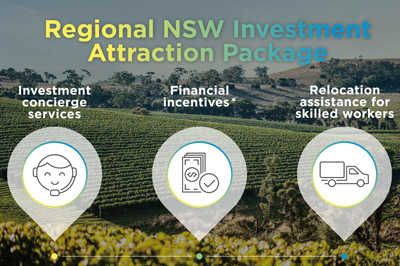 Karen Borg highlighted the range of services on offer from Jobs for NSW for startups and fast growing SMEs - including Minimum Viable Product and Business Partnership grants and Accelerated Growth Loans and Gazelle Loans Guarantees – and a concierge service to smooth the way. Karen also said that the NSW Government is establishing a Startup Hub in Sydney’s CBD to supporter incubators and further grow the sector. Michael Malone of Phi Capital said Australian startups need to be more aggressive in targeting international opportunities, like US and Israel companies, and target the big end of town which is keen to work with small businesses that are flexible. Raj Dalal of TiE Sydney said Aussie startups have a can-do reputation in Silicon Valley and companies like Atlassian are helping show the way. Businesses can scale quickly if they can solve an industry problem, and there are opportunities to bring competition to areas such as real estate, superannuation and insurance. Jobs for NSW certainly has its fans out there in startup world - Kate Edwards of Kontented and Snackable TV spoke highly of Jobs for NSW’s support which was used to develop her team’s cross-disciplinary skills. The company aims to take on Netflix by targeting young people with short form content, and now has millions of viewers on board. Her advice included to be as collaborative as possible, work hard and get runs on the board, and invest in staff training. Simon Meyer of FutureYou, which is on target to generate $10 million in its first year, backed itself with a long business planning phase, sourced experienced expert advice, invested in key roles, and capital raised with the support of a Jobs for NSW $600,000 loan guarantee. The final day also included a digital health conference focusing on digital health innovations and drivers, ehealth records and data, and clinical systems, integrated care and Telehealth applications.